All photos taken during Reading Caravan events. We are happy to announce that we are embarking on a nationwide book distribution through Reading Caravan. This is quite ambitious but will need all the support you could give, especially colorful children's' books. The children beneficiaries during RC opened their books immediately, with thirst for knowledge seen in their faces. Some of them were known to have reading problems as all public schools conduct a pre-post school year reading assessment. But with the eagerness in their eyes, the problem is not them but access. They do not even know how to open and flip the book pages properly. The situation right now in Philippine public schools is that all books are printed of black ink on newsprint pages. Gone are the colorful hardbound pages the 70s children experienced. These books today are dog-eared if not completely useless bound by packaging & scotch tapes for years of tear and wear. 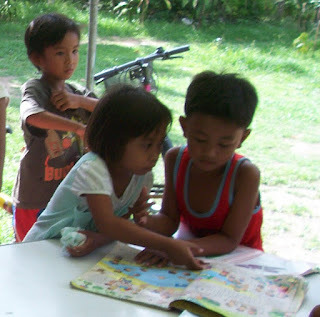 Many books are donated by private and government agencies but they are kept at the school for room or school libraries for visitation purposes where schools are graded by DepEd principals and officials. They remain untouched because these are often accounted for by teachers every end of the school year and children are afraid to be reprimanded if ever they will damage the books. The schools have reading corner in every classroom and reading sessions required among pupils. The pupils are even required to keep diaries (some of them have the so-called DEAR time where they are required to read and keep a journal about their reading experiences). However, marginalized pupils who may often go to school with dirt in their hands from play or work are timid and shy away from these library books. It is highly probable that their hands are wet with perspiration (with Philippines being a tropical country) and will leave dirt mark on the book pages. They would rather pretend to read (stare at the book in front of them) than be reprimanded afterwards. Books with colors are preferred by children of all ages. It is probably the reason why they are made colorful in the first place. Textbooks are often the only encounter of marginalized children with books. As mentioned earlier, they are often old and useless, bound for landfills if not illegal burning. They are hardly attractive as most were done for the sake of printing, binding, and meeting delivery obligations in order for government vouchers to move. 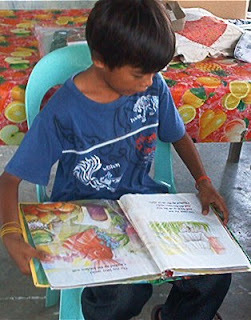 Cost of respectable children's books in the Philippines start from P50 (US$1.25) for those with slashed prices. Many used books are of affordable prices from only one retailer - the BookSale. US-sourced used children's books at BookSale range from P15-105. But often, retail shops are rare in many areas accessed by the poor. They have branches in most Metro Manila malls but only National BookStores are seen in provinces. National Bookstore is also perceived a mid-high class retailer and marginalized families only purchase from public town markets abound with fly-by-night published "books". These are prized at P10-P20 but are a replica of the textbooks - black ink in newsprints at 20 pages maximum. They are often coloring books with text lifted or reworded from Disney books. Entry of China and India-made books with typographical if not intentional errors are also available in Chinese and regular grocery stores, which is most welcome due to the colorful pages at a much lower cost than at NBS. But these books, too, were often snubbed by marginalized buyers even at P15-P30 cost. Many visit these stores for notebooks, writing materials, and required projects, but rarely for books. 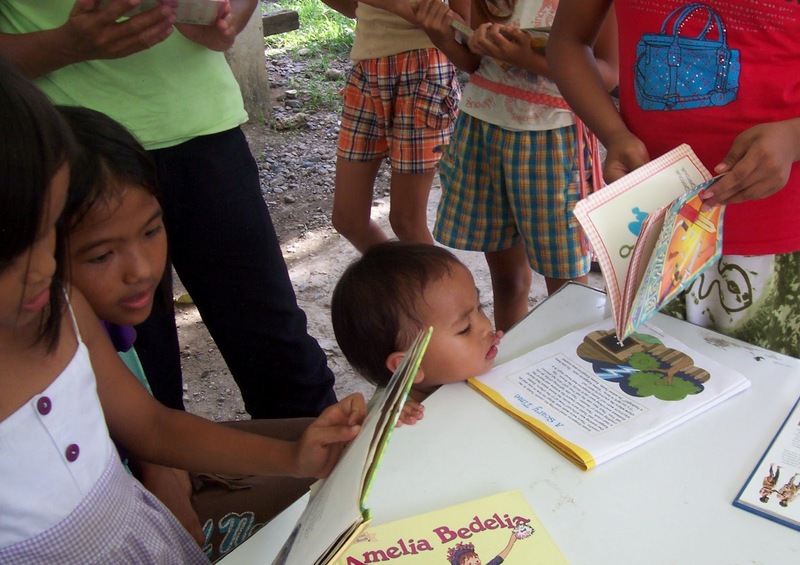 One of the more aggressive local publishers - Lampara - a subsidiary of Precious Pages Corporation - published many children's books over the years which are more affordable than they were at imported price. However, these, too are of limited circulation and cost remain inaccessible. Majority of families (4-5 members) in the Philippines earn only an average of P150 ($3.75) per day. Cost of food is about P120, and the rest is usually allowances for school children. A P50 book is a luxury if ever they'd see one available in a 3-kilometer distance. These are the main reasons why colorful, respectable children's books should be distributed for free to pupils and out of school youths. Owning books for marginalized children is a phenomenon as they were never required to own one at school and neither do they have actual access to these books. It will open their eyes to a world outside ignorance and poverty and motivate them to read and learn more. Your help is as precious as their improved future.